Cover artwork: Portrait of Joseph Haydn, c1790. Haydn's two visits to England in the 1790s left him with an enduring affection for the country and its people — an affection warmly reciprocated. The combination of a succession of musical masterpieces, with a degree of sociability and curiosity astonishing in their energy for a man of sixty, rendered him so celebrated that even George III, for whom music seemed to have begun and ended with Handel, was forced to take notice: 'Dr Haydn, you have written a great deal', to which Haydn modestly replied: 'Yes, Sire, a great deal more than is good'. In one case at least the warmth of the relationship exceeded the merely sociable. One of Haydn's earliest biographers, the painter Albert Christoph Dies, described how towards the end of his long life Haydn showed him a set of letters copied into his notebook: 'They are letters from an English widow in London who loved me. Though sixty years old she was still lovely and amiable and in all likelihood I should have married her if I had been single.' Either Haydn's or Dies' memory was apparently fallible: Rebecca Schroeter is reckoned to have been younger than her husband Johann Samuel, who was appointed music master to Queen Charlotte in 1782 but died in 1788 aged only thirty-eight. One authority describes him as the first exponent of skilled pianoforte playing in England. Rebecca also was obviously a talented though not virtuosic player, and it is likely that the lessons she started taking from Haydn in summer 1791, during his first visit, soon became more or less a formality. She wrote frequently to Haydn during these two years (he left for Austria in summer 1792, returning to London in February 1794) in charmingly unrestrained terms: 'No language can express half the love and affection I feel for you.' No letters survive from Haydn's second visit. This may be because they were copied into the now incomplete fourth notebook, or because the proximity of their lodgings (Rebecca lived at 6 James Street, Buckingham Gate; Haydn — possibly in rooms found for him by Rebecca herself — at 1 Bury Street, St James, roughly where Christie's of King Street now is, and a short walk away across St James's Park) rendered them unnecessary. Any cooling of the romance may be belied by Rebecca's signing a publisher's agreement on his behalf as a witness in 1796 and her subscription to the publication of The Creation six years later — and by Haydn's dedication to her, after his second and final departure in August 1795, of this set of Piano Trios, published at the end of October by Longman and Broderip. This first edition was entitled 'Three Sonatas, for the Piano Forte, with accompaniment of Violin and Violoncello'. Such a description was by now anachronistic in view of Haydn's radical development of the piano trio from over the preceding forty years. His earliest essays, between 1755 and about 1760, were genre pieces usually in two movements, scored for harpsichord with violin and string bass — probably a small violone — which bore titles such as Partita, Divertimento and Capriccio. By the time he resumed composition for piano trio, in the 1780s, he had adopted the fortepiano ('Hammerklavier') as his keyboard instrument and a cello as the bass; the increased warmth of sound and range of the keyboard gave it prominent place. Even so, the choice of styles for the individual movements (two or three as the mood took him) was still eclectic, still as if he considered the music more or less 'incidental', certainly by comparison with the string quartet which by now in his hands was attaining fully 'classical' proportions. But the change he heralded in 1781 when publishing his 'Russian' Quartets, which were to have such an effect on Mozart and lead to the latter's quartets dedicated to Haydn himself, would bear fruit in the Trios of the 1790s: they were written, he said, in 'a new and special manner'. By this he was referring to the continuity of thematic treatment, the working out over an extended span of melodic and contrapuntal development derived from the leading motifs. By virtue of the instrumentation this scheme was never as fully explored in the Trios as in the Quartets. 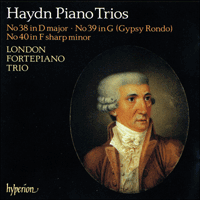 But this very fact lends the Trios so much of their enormous charm, as Haydn in this most intimate of chamber music styles mingles development with sudden quirkiness, of rhythm and especially key. The ease with which he can move from the initial F sharp minor to E flat minor during the first movement of No 40 is, or ought to be if one tries to recapture the sound world of the original audience, astonishing. The violin is by now an equal partner with the piano. If the cello still seems tied to the bass part, a role from which Beethoven would finally emancipate it (note that his considered decision to make his Op 1 a set of piano trios shows just how much Haydn had elevated the form to a level of profoundly serious enterprise) this should not be thought a lack of imagination on the master's part but rather a proper understanding of the necessary tonal richness arising from the alliance of keyboard and string bass. Later, more powerful pianos would render this reinforcement otiose — but that must be one of the most powerful arguments for hearing this enormously sophisticated music played by instruments akin to those for which it was originally designed. Considering (what one might conceive to be) the limitations of the chosen instrumental forces, these three Trios possess startlingly different characters. They have in common the three-movement structure, with the individual movements based on extended sonata form, sets of variations or a tripartite arrangement. The G major Trio is unique in that its two outer movements are in rondo form, but here the first two are a sort of introduction to the finale, the first being slowish, the second (a lovely set of double variations in major/minor mode) slower still, as if to emphasize the tearaway finale. This is the famous 'Gipsy Rondo' well known in many arrangements. Haydn was largely working from memory in conveying some of the flavour of the itinerant bands which were pressed into service by Austrian officials as a morale-boosting way of recruiting soldiers from their previous occupation in the fields. (There is a 1791 engraving of such a band playing in front of Haydn's sometime home at Esterhazy). But he seems, especially in the 'minor' sections, to have employed some of the original spiky tunes and strumming accompaniments. The D major Trio has just as much individuality. Its rhetorically dramatic pauses in the first movement combine with a perfect example of Haydn's 'new and special manner' as he develops the single theme, and contrast with the baroque-style dotted rhythms of the central movement which daringly leads straight into the grave, spare dance of the finale. The key of the last Trio harks back to Haydn's Sturm und Drang period of the 1770s, but the mood, and the mastery, is now quite different. Individualist extravagance has given way to tense melancholy, but without any loss of energy. The slow movement is probably a reworking — we're not sure in which order the pieces were composed — of the equivalent F major movement of the Symphony No 102, hailed on its first performance in February 1795 by The Morning Chronicle as 'sublime … magic'. The profound and tautly reined feeling of the finale, probably the last thing he wrote and delivered with the rest of this set to his publishers before he left England for good, must bring vividly to mind Haydn's own emotions as he quitted the country which had done him so proud, and to which he had devoted such glories from the most fecund years of his composing life.